After the first meatless Friday of Lent, I decided to start the morning off right with some breakfast meat. 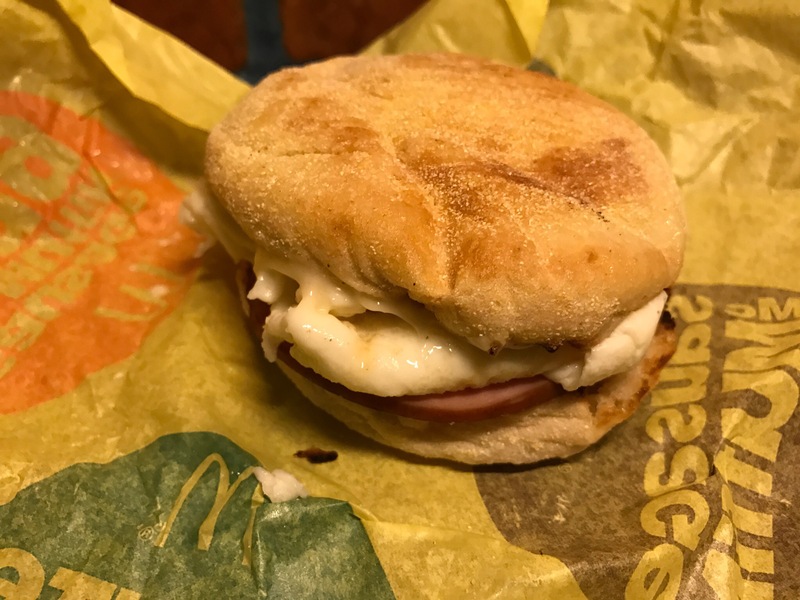 My morning was too busy to make anything at home, so I drove through McDonald’s and grabbed an Egg White Delight McMuffin, because if you’re going to eat something as bad as fast food, might as well try to be health-conscious about it. The reason my morning was so busy was because Susan and I were headed to Miami for Veuve Clicquot’s “Carnaval” – an event celebrating Brazil’s Carnaval complete with samba dancers, a samba band, and international supermodel and Victoria’s Secret Angel Adriana Lima hosting the festivities. A lot of champagne was imbibed and fun was had by all. The Carnaval event also had a selection of Miami’s best food trucks, but the lines for them were longer than the champagne lines, so we decided to enjoy some of the local fare instead. After a little shopping in the Wynwood Art District, we found a gem named KYU, an Asian-fusion joint with an awesome happy hour. We sipped on Wynwood Mules and noshed on Crunchy Kale, Korean Fried Chicken with Butter Braised Chicory, Crispy Pork, Roasted Cauliflower, and Pork & Duck Sausage. KYU was outstanding, and we were just there for happy hour. I can’t wait to return for dinner next time I’m in Miami.